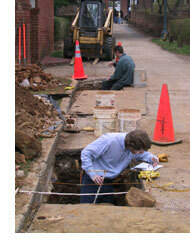 Rivanna Archaeology offers a full range of archaeological services that can be matched to defined project objectives. All archaeological research is performed in accordance with state and federal guidelines. Our staff serves as knowledgeable and experienced liaisons between clients and government agencies. At all levels of research, our methods, findings, and management recommendations are presented to clients in detailed technical reports. Through archival research, predictive modeling, and limited field-testing, reconnaissance surveys can provide valuable planning-level information regarding potential cultural resource issues, contributing to efficient project planning and helping to avoid unforeseen project delays and cost overruns. Designed to inventory cultural resources and provide preliminary assessments through systematic field survey. Rivanna Archaeology has extensive experience in the design and implementation of Phase I archaeological surveys and supporting archival research for properties of all sizes. Focused archaeological testing to fully determine the size, age, content, preservation, and research potential of one or more archaeological sites or other historic resources. Significance evaluations typically address the criteria for inclusion on the National Register of Historic Places. Where appropriate, Phase II significance evaluations include in-depth archival research to supplement the results of excavation. When development impacts are unavoidable, Phase III data recovery projects consist of intensive excavation and analysis designed to preserve significant archaeological data. Our staff is also experienced in the development of innovative and meaningful mitigative measures, including public outreach and information dissemination that go beyond data recovery.